The small and portable real-time UHD HEVC encoder platforms for professional media will be demonstrated at IBC 2016. September 9, 2016 – Advantech (TWSE: 2395.TW) today announced a collaboration with Ambarella (NASDAQ: AMBA) to integrate their low-power HD and UHD video encoding technology into modules and customizable compact application-ready platforms for the professional video market. By putting the latest video processing technology from Ambarella at equipment manufacturers’ fingertips, Advantech reduces time to market of portable UHD/4K contribution solutions for broadcasters. The technology is used in the new VEGA-2001 4K/UHD Encoder Module and the new VEGA-6300 Compact Encoder Appliance. Both VEGA-2001 and VEGA-6300 feature 4Kp60 capable quad SDI and HDMI 2.0 video acquisition interfaces and can stream either H.264 or HEVC encoded video across a Gigabit Ethernet link or a USB-attached wireless network interface. In common with the existing VEGA-2000 module, control and management is via an embedded web server or a CGI-style remote API.This first generation of 4K-ready products is based on the Ambarella H1 product family. This can pre-process, scale and encode live video in H.264 standard at up to 4Kp60 and in H.265/HEVC standard at up to 4Kp30. Duplicate streams, each with different resolutions and encoding parameters, can be created and streamed in parallel, ready for insertion into CDNs or OTT stream packagers.“We are excited to be able to expand our range of contribution encoder modules and related appliance platforms to include 4K/UHD capability,” said Brian Carr, Strategic Product Development and Marketing Director at Advantech. “Ambarella SoC video compression technology gives both the VEGA-2001 module and the VEGA-6300 appliance a great balance of small size and low power for the high performance encoding capability they provide”.HEVC compression is especially suitable for reducing the bit rate required for video transmission, especially for the higher resolutions and frame rates considered advantageous for live sports and event coverage. The low power consumption and small form factors mean the new products are especially suitable for field or remote applications or where there are thermal constraints such as in enclosed cabinets or OB trucks.Advantech also plans to integrate the latest generation Ambarella H2 SoC into their next generation modules and appliances. The H2 product family, which was introduced earlier this year, offers much more performance in a similarly low power footprint, capable of performing 4Kp60 HEVC encode in both 8 bit and 10 bit modes including the HDR-10 format for High Dynamic Range (HDR) content. "We see Advantech as a valuable partner to bring the benefits of our technology to a wider customer base in the professional video and broadcasting market,” said Chris Day, VP of Marketing and Business Development at Ambarella. “Advantech’s strong integration, customization and design capabilities reduce broadcast equipment manufacturers in-house development efforts and give them a significant time-to-market advantage in the roll-out of their next generation compact and portable professional media solutions”.Advantech will be demonstrating the capabilities of the new encoders in IBC booth # 11.C22, September 9-13, 2016 in Amsterdam. For more information and to book an appointment, please contact video.solutions@advantech.com or visit www.video-acceleration.com. The DSP-8682 integrates eight Texas Instruments TMS320C6678 multi-core digital signal processors (DSPs) each with 2GB of DDR3 1333/1600MHz 64-bit DDR3 memory, the PLX® ExpressLane™ PEX8748 PCIe Gen 3 switch, a Xilinx XC3S200AN Spartan-3 FPGA, and an IDT CPS1616 Serial RapidIO Gen 2 switch to achieve the highest possible performance levels in a full-length PCIe form factor. The PEX8748 and the IDT CPS1616 interconnect x2 lanes between each DSP device. A high speed connection to the host is assured through the PEX8748 switch’s PCIe x8 Gen 3 interface for the fastest possible data transfers. A HyperLink chip-to-chip interconnect interface has been implemented enabling the on-chip navigator to transparently dispatch tasks for execution between DSP pairs. In addition, an SGMII daisy chain between all devices is connected to a Broadcom BCM5482S providing two RJ-45 Giagabit Ethernet connections the I/O panel. The DSP’s provide fixed- and floating-point capabilities enabling the board to perform 2,048 GMACs (Giga Multiply-Accumulation operations per second) using the embedded C66x DSP cores inside the TMS320C6678 devices. The 64 DSP cores on the DSP-8682 make it ideal for power efficient solutions based on commercial and industrial servers needing the highest performing video processing technology on fast-to-deploy PCIe add-in cards. This raw computing power makes the DSP-8682 a perfect fit for advanced and complex video processing such as JPEG2000 for 2K/4K processing, AVC-Intra 50/100 and AVC-Ultra, deep-color pixel manipulation, HEVC/H.265 and motion-compensated temporal filtering. It is also suited for applications in many industries such as media gateways and high performance computing. The DSP-8901 is designed with 20 TI TMS320C6678 DSPs. With its twenty onboard TMS320C6678 DSPs at 1.0 GHz core frequency, the DSP-8901 provides 160 cores of processing power to reach the higher levels of performance density needed to build the highest capacity wireless media gateways. The DSP-8901 significantly reduces overall system power dissipation and system cost, and frees up valuable slots in gateway elements for additional subscriber capacity and throughput. The DSP-8901 includes a high-performance Freescale QorIQ P2020 processor. The powerful Broadcom BCM56321 switch terminates the 10 gigabit Ethernet fabric connections and distributes traffic to the twenty DSPs. The DSP-8901 offers unrivaled packet and media processing capabilities. For increasing demand in high end video conferencing, broadcasting and telepresence fields, the DSP-8901 ATCA blade also offers unrivaled image processing performance for compression and decompression, image analysis, filtering and format conversion. DSP-8601 is a USB 2.0 high-speed video capture module with 1 analog video input and 1 stereo audio input. DSP-8601 supports H.264 compression formats up to full D1 resolution at real-time frame rate (30/25fps). 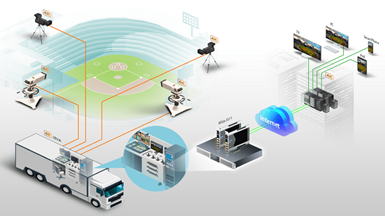 With an easy-to-use software development kit (SDK), DSP-8601 is an ideal solution for system integrators to implement versatile video capturing and encoding applications that fulfill a wide variety of customer requirements.